Workers at Marriott Hotel-owned chains in San Francisco say they are demanding job security and a wage increase to live in the San Francisco Bay Area, one of the most expensive areas in the country. Peter Chaffo, a banquet service worker at the Palace Hotel, says he is striking to demand that Marriott does not cut workers’ hours by half as it has proposed. Chaffo, who is 47, has worked for the company for 27 years and commutes an hour each way from Concord, California. He makes nearly $26 an hour but says the company’s proposal is insulting to the workers who keep the hotels running. Maryland-based Marriott says in a statement that its proposal matches the “economic terms” of the last contract and does not propose any benefit changes. Thousands of housekeepers, cooks and other Marriott hotel workers are on strike in San Francisco and San Jose after months of negotiating for a wage increase. 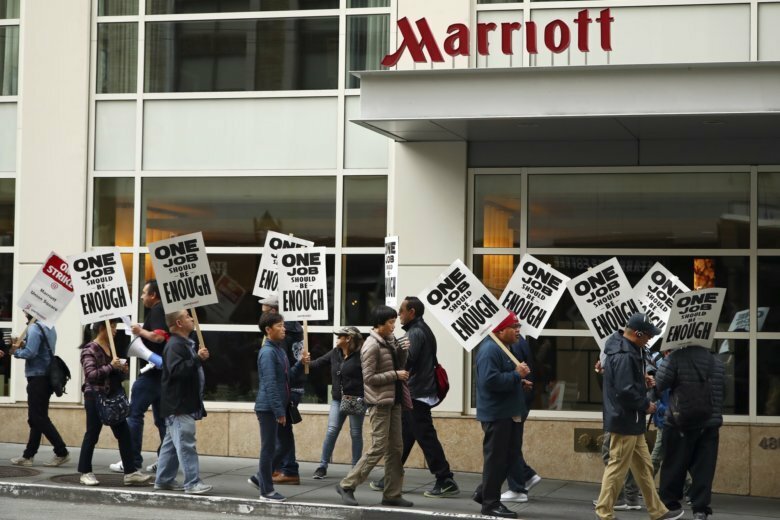 Unite Here Local 2 spokesman Ted Waechter says about 2,500 Marriott hotel workers are picketing Thursday outside seven hotels in downtown San Francisco, one of the city’s busiest tourist areas. Waechter says many union members have to work at least a second job to make ends meet. Hotel workers have walked out at seven Marriott hotels in Boston on Wednesday in what union organizers say is the city’s first-ever hotel strike. The Maryland-based company says its proposal matches the “economic terms” of the last contract and doesn’t propose any benefit changes. The union says similar strikes are being considered in San Diego, Detroit, Seattle, Oakland and Honolulu.